Don't you wish that there was a cheese product that would hold its consistency when heated? Well, there is! 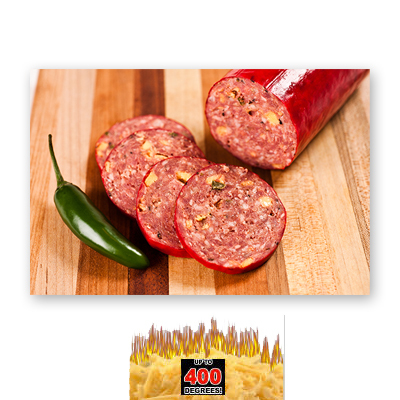 This product is real cheese and perfect for all sausage products where cheese is added. High temperature cheese is specially made so that it will not melt when cooked under normal smokehouse temperatures. Use 1 pound of cheese for every 10 pounds of meat. Ingredients: American Cheese and Swiss Cheese (Cultured Milk, Salt, Enzymes), Jalapeno Peppers, Cream, Sodium Phosphate, Salt, Natural Smoke Flavoring, Sorbic Acid.